The summer after my freshman year of college, I told somebody's mother that I wouldn't be attending her son's funeral. I remember the moment, if not the conversation, with great clarity. I was working in my dad's shop, filling orders for spare bike rack parts, when my phone rang. My hands were sticky with glue from the ancient packing-tape dispenser. Here are some things I didn't tell her: I never met your son. We only talked on the phone once or twice. He had my number in the first place because we played at being general managers in the same imaginary baseball league. When Chris and I did speak, it was about lineup exports. Here is something I don't remember if I told her: I'm so sorry. I was 18. Chris, sick as he was, could not have been much older. I panicked. Our friendship was too convoluted and trivial to explain in the moment. Who was I to waste the time of a mother as she slogged dutifully from A through Z in her dead son's contact list when I didn't even know what her dead son looked like? But there was also another thing that was harder to admit: Chris's death turned something fake into something real. 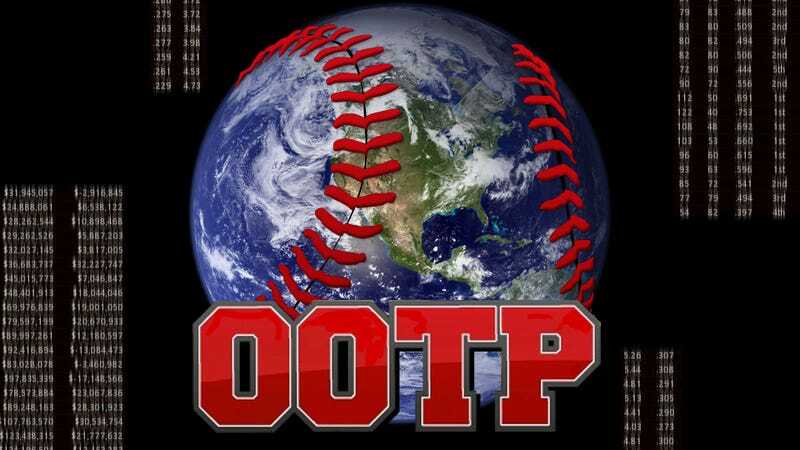 The world that Chris and I shared was centered around a game called Out of the Park Baseball, or OOTP. In simple terms, OOTP is a simulation game—a computerized descendant of Strat-O-Matic. Imagine a highly complex, supercharged version of the Franchise Mode you'd find in a sports video game and take away the pixelated players moving about the field. What you have left is an insanely powerful, super-complex text-based approximation of baseball management. OOTP allows you to set lineups, make trades, and sign free agents. It also allows you to set ticket prices, allot a specialized country-by-country budget for international scouting, and take part in your very own Rule 5 draft. "OOTP is the only baseball sim I've ever been addicted to," says Curt Schilling on the company website. And he's not lying, either: Schilling has posted 93 times on OOTP's teeming, vibrant message board, about topics so banal only a truly committed player could find them compelling: preventing injuries to pitchers in the low minor leagues; adjusting the average ages of the amateur draft pool. Schilling appears to play alone. His message board posts indicate a man deeply invested in his own private baseball world: "I am in year 7 of my team, won the WS in year 3, haven't won it since," he writes in one post. In OOTP, you are a prisoner of the whims of the artificial realities that you inhabit. Chris and I played in an online league called Major Baseball League, or MBL. It worked a lot like fantasy baseball. There were 30 GMs, one for each team. Instead of winning or losing based on the real-life performances of players you drafted before the season, we won or lost according to the simulated performances of ratings-based approximations of real-life players. We moved fast, playing a few MBL seasons and offseasons in a calendar year. Trade negotiations, which were ongoing, happened by way of AOL Instant Messenger. The MBL message board was a hub of activity—there were articles written, awards dispensed. For a while, there was an MBL Arizona Fall League. I was unnaturally susceptible to the charms of OOTP, the type of kid who filled the margins of all his notebooks with fantasy-baseball trade ideas and optimized Dodger lineups for five years down the road. In school, my class notes were framed by scribbled speculation about what kind of real-life stats Shawn Green and Brian Jordan might put up. By the end of my senior year in high school, I'd gone down the rabbit hole. At my peak, I was playing in the neighborhood of five sim leagues at a time, including a basketball league (using a program similar to OOTP), and a historic baseball league set in the 1950s. My computer screen was full of trade negotiations, the AIM chat windows flashing in the menu bar. The scribbled marginalia in my notebooks began to annex entire pages. Meanwhile, I also played alone—eschewing the company of fellow human GMs to enter fictional worlds, with fictional players, and leading franchises decades into the future. In Robert Coover's 1971 novel The Universal Baseball Association, Inc., J. Henry Waugh, Prop., middle-aged accountant Henry Waugh becomes increasingly obsessed with the alternate reality of his own invented table-top baseball simulation. The players, the rules, the very system by which the Universal Baseball Association operates are all of Henry's own devising. He invents histories, writes game recaps, and is always on the hunt for names for potential players. (The book is worth picking up for the names alone—extravagantly folkloric American names of the sort you might hope to find on the headstones in a Civil War cemetery, names like Swannee Law, Rag Rooney, and Sycamore Flynn.) Henry becomes so invested in the fates of his players and teams that the line between their world and his begins to blur, even though the entire Universal Baseball Association exists only in Henry's composition books and dice throws. The dice are the heart of the Association. They are miraculous and cruel. Henry has perfected a detailed, comprehensive odds-based system in which three dice can determine anything that could happen in a baseball game. Henry is fully aware of the irony: He gave the dice their power, and yet he is enslaved by them; enslaved by the banality of actual odds and by the omnipresent possibility that he will roll a 1-1-1 or 6-6-6 and be dispatched to the Stress Chart, or more dramatic yet, to the Chart of Extraordinary Occurrences, whence players are led into fisticuffs, into fixed ballgames, even into death. "These two charts," Coover writes, "were what gave the game its special quality, making it much more than just a series of hits and walks and outs." I don't think J. Henry Waugh would be offended by my opinion that Out of the Park Baseball shares this special quality. The game offers an infinite number of alleyways into baseball—and, once inside, infinite possibilities. You can be a manager, a minor league manager, a general manager. You can, like Henry, be a commissioner. There are story lines. There are sabermetrics. There are bean balls and ensuing brawls. But what gives the game its mystical power, what makes it so much more than just a series of hits and walks and outs, is the fact that one never fully plays OOTP. On some level, the game plays itself. Like Ron Washington says, baseball do what baseball do—often to the manager's dismay. Building a dynasty in a console video game's Franchise Mode or in a traditional fantasy league can be a matter of simply executing a plan, exploiting a system. Doing so in OOTP requires an aligning of the stars. As an OOTP GM, you can't fall back on playing the game yourself (roster construction be damned) or blaming it on real-life injuries (fantasy baseball is all luck anyway). In OOTP, you are a prisoner of the whims of the artificial realities that you inhabit. After a five-year sim-baseball hiatus, I recently downloaded the newest version of Out of the Park Baseball, OOTP 13, and so far the stars have not aligned for me. In season after season, in every kind of league setup, in ways easily predictable and completely vexing, I have failed as a GM. I've quickly rediscovered how terrible I am at the game, how unsuited temperamentally I am to a hobby that pushes back with so much force, and demands so much attention. Time moves fast in OOTP. Ratings tumble in great heaps; scouting departments get No. 1 picks all wrong; and sometimes Troy Tulowitzki bats .230. Sometimes fictional first basemen named Tex Houston win the triple crown playing for the Seattle Whales. You can't predict baseball. In real life, this is not a problem for me. In OOTP, it is. The game imitates life too well. Circumstances change in frustrating ways. OOTP disappoints me. Realizing that I'm disappointed only disappoints me further. Yet I continue to play. Despite having the ability to customize game settings, to do away with whatever fluctuations and quirks make the game so infuriating, I choose not to. It is OOTP's capacity to frustrate me, to simultaneously heighten and numb my senses like some sort of low-grade methadone, that draws me back in. Over the past few weeks, in order to be even halfway productive, I've had to make a forceful and conscientious decision to close OOTP 13, or not to open it in the first place. Even reading The Universal Baseball Association, which I bought explicitly to read for this article, and which is not a long book, and which by all means I really enjoyed, became a chore in the most literal sense. Why bother with Henry's Pioneers when Tex Houston and my Seattle Whales franchise are right there in front of me? The game has nearly made me late for work. It has rendered my apartment a mess, my refrigerator even emptier than usual. Over the last few days, I've found myself re-reading Tom Bissell's insane and depressing account of getting simultaneously addicted to cocaine and Grand Theft Auto. I've found myself perusing websites like WowDetox.com, where people post horrifying stories about lives squandered because of World of Warcraft. (Sample entry: "I Used to listen to Beatles music while playing WoW, now I can never listen to Beatles music without thinking about the game."). I don't know whether I'm trying to scare myself straight, or just remind myself that it's not so bad, that I don't need to feel guilty or scared. It's the fear that will get me. Soon enough, I'll uninstall OOTP 13. The game icon will prove too ominous on my desktop. The opportunity cost of each hour spent in simulated arbitration hearings will prove too high. I know this because it's happened before. The last time was in 2007, when I quit all of my sim leagues, MBL included, for good. I'm the sort of person who never feels like he's being productive enough (in part because I am rarely being especially productive). Plenty of people are capable of playing OOTP and also living well. I am not one of those people. The specter of time better spent looms behind every chat window and scouting profile. While writing this, I reached out to a few of the guys I played with in MBL. I'm still in regular contact with some of them anyway. They all said that, as a GM, I was sort of bipolar: one minute tentative, the next wanting to trade Kevin Brown for prospects. Generally, I was ineffective, which makes sense. My management style paralleled my relationship with the game itself. I love thee, I love thee not; I love thee, I hate myself; I love thee, I hate myself even more. You get the picture. In college, especially, I struggled to balance my involvement in sim baseball with my involvement in everything else. I aspired to keep the worlds as far apart as possible (I may lack Henry's imagination, but I best him in self-control). I never talked about OOTP to my real-life friends. Even my girlfriend, whom I've known since freshman year of college, had no idea that I played these games until a few weeks ago. The chasm I dug between OOTP and everything else is why now, almost seven years later, I still think about getting that phone call from Chris's mom. I think about the phone call more than I think about Chris's death. At the time, he was not a fully formed person to me. Sure, I knew Chris was real. I even had vague notions of his illness. We had negotiated trades, chatted meaningfully about sports and life, and spoken on the phone those couple of times. But Chris was of the game in the same way that Tex Houston, Seattle Whales first baseman, was of the game. Our relationship was defined by OOTP. It existed in a world I tucked into the far corners of my imagination and relegated to the margins of my notebooks. When Chris died, that world revealed itself as dramatically subservient to the goings-on of the larger one. Chris had a mother. Chris had a funeral. The MBL GM of the Year Award was named for Chris (and still is). And eventually somebody came in and took over his Angels franchise. Meanwhile, the game has not changed. The MBL has upgraded from one edition of OOTP to the next. It has wrecked entire histories only to begin again with brand new ones. But mostly it has hummed along, oblivious. Dice don't care who throws them. Eric Nusbaum founded Pitchers & Poets and is a founder of The Classical. His work has appeared in Slate, The Billfold, GQ.com, TheAtlantic.com, and The Best American Sports Writing. He may one day tweet again @ericnus.